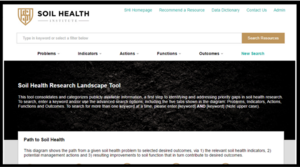 The Soil Health Research Landscape tool may be accessed at www.soilhealthinstitute.org. New Soil Health Research Landscape tool gives farmers, researchers, CSR leaders and policy makers comprehensive, searchable information system. RESEARCH TRIANGLE PARK, NC, Jan. 03 /CSRwire/ - The Soil Health Institute (SHI) today announced the release of the Soil Health Research Landscape tool. The online library and search engine will be a resource for agricultural and environmental scientists, industry leaders, agricultural producers, conservation policy makers, agricultural journalists, and others interested in soil health. “In addition to the most up-to-date information on soil health and its relationship to soil amendments, cover crops, erosion control, and other agricultural and land management practices, the Soil Health Research Landscape tool will include data, metadata, methods descriptions, standards, and related economic impacts for soil scientists, researchers, and analysts. The information will be available publicly through the Institute’s website. The Institute will assess no fees for using the Research Landscape tool,” said Steven Shafer, SHI Chief Scientific Officer. Shafer added that the initial library includes more than 1,000 scientific research papers, research progress reports, and other kinds of publications and references. Building the tool’s library of soil health papers and information will be an ongoing, open-ended effort by the Institute and its partners. “The Soil Health Research Landscape tool allows users to connect soil health problems, management actions, and desired outcomes with research addressing their particular situation, whether it be from a specific production system, climatic zone, or geographic region,” explained Wayne Honeycutt, SHI President and Chief Executive Officer. “Situations in which no research literature exists indicate gaps that merit future consideration for soil health research. Because enhancing soil health can increase productivity, water quality, carbon sequestration, and drought resilience, while also reducing greenhouse gas emissions, this release of the Soil Health Research Landscape tool is an important step in providing a comprehensive, searchable, and publicly-available information system for achieving both agricultural and environmental benefits,” Honeycutt added. With its release, the Institute acknowledges key contributions from its partners. “Datu Research, LLC, of Durham, North Carolina, worked closely with us to design the web-based search engine and assemble the initial holdings in the online library. The U.S. Department of Agriculture’s Natural Resources Conservation Service contributed their collection of more than 300 important references on soil health, and numerous individuals contributed their expertise in the design and review stages,” Shafer said. “This is the kind of public-private partnership that demonstrates what the Soil Health Institute strives for,” he added. The Institute requests that individuals who use data from the Soil Health Research Landscape tool cite the Institute’s website as their source and link to the data when possible.